with the blade. She could move well, when she wasn't being crushed by Riatsu. Dallag dalma: Ow. That hurt! The look on his face was so worth it however. OnlineHost: Escien Delacruz has entered the room. Dallag dalma: of the 11th who were present just grumbled and backed away. bunnies hopping behind him quickly, flailing around. :: AHHHHHHHHHHHHHHHHHHH! Dallag dalma: She blinked at his accusation and pushed him into the arena. "Nekura Kato, 11th division. We're going to fight now... you consent right?" fighting stance, her zanpakutou already in hand. "Come on!" be knocked out so easily and was grinning like a cheshire her eyes bright. Escien Delacruz: r, arms wide open. :: HUUUUUG! was now a dead bunny in the making. TOUCH A BUNNIE FUN TOY! Escien Delacruz: an call me Are-san! bad. He didn't like his hair being messed up, but, that was her biggest flaw. Escien Delacruz: owards him, even though he couldn't move. : Waaaahhhh..
retains its beauty." She was fair, right? Rondanini! Look upon yourself with horror and then claw out your own throat! to the salon, I meant it. May as well get our hair trimmed so its even." my ponytail back. It's bad enough I had to cut it off. Dallag dalma: She was sure he had fed them crack but wasn't about to say so. before finishing his thought. :: Oh, I remember. Could I get a trim please? wave a bit and use his new nickname for her. :: Hi Putty Tat. Escien Delacruz: r a bit more. :: Okay Neko. That's a nice name. Escien Delacruz: ed to give up.. I don't understand the feeling though. brightly at him, he might've made a friend. AS long as he could fight anyway. women's association made certain of that. How... could you be unaware? Dallag dalma: given an educational packet then... at least in my squad." them, they don't like me going anywhere outside of the barracks that much. you should... wait you don't like fighting.... How canyou not like fighting?" risking other people getting hurt, not when it's me who is the target. sick on the way there. break at least half of them. even as he was punched. She had to crawl, she couldn't gain her footing. plus a small few cracks. Built On Luck: [Whatever. 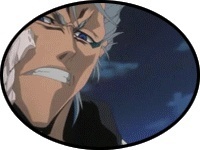 Be glad James doesn't want me killing shinigami.